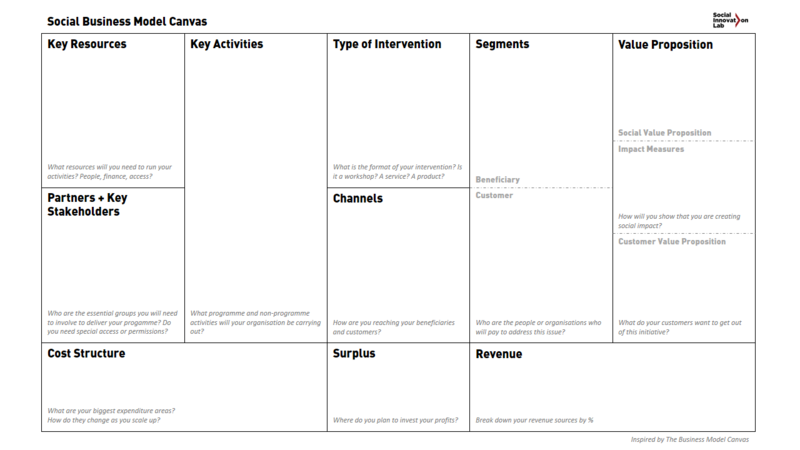 Based on the idea of the Business Model Canvas, this tool helps to develop social businesses – also useful for for-profit businesses. The Social Business Model Canvas is inspired by the Business Model Canvas and created by the Social Innovation Lab. The goal is to support social innovators by designing their Business Models. Social Businesses focus on the impact they create for beneficiaries rather than creating profits. Therefore, the tool takes additional aspects into account which helps in creating a social business model. The component ”Segments“ is divided into “beneficiary” and “customer”. This supports the aspect that beneficiaries often do not pay anything but are crucial for the business model. The Value Proposition consists of the elements “Social Value Proposition”, “Customer Value Proposition” and “Impact Measures”, which define how you control your social impact. The type of intervention describes the type of product that will deliver the value. Besides partners, the canvas includes the key stakeholders that are / should be involved in your program. The component “Surplus” describes where you plan to invest your profits. 1. With an idea: start with defining the value proposition for a specific customer segment. 2. With potential / existing customers: start with the customer segment and ask what value proposition you are delivering / could deliver to them and how. 3. With your resources: Start to think what key resources (competences, experiences, physical resources, financial resources, etc.) you or your partners have and based on this develop your offer for a specific customer group. Use sticky notes because they can be easily removed or changed. Use different colors for different value propositions and customer groups. Create many different versions evaluate them with a Strategic Fit and / or a SWOT analysis. Do you know enough about the needs of your beneficiaries or customers? First step is to create empathy with them and to understand their situation, daily life, wishes, pains and gains. Use one of the “Understand & Explore ” tools to learn more.